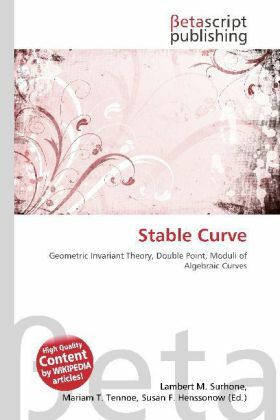 In algebraic geometry, a stable curve is an algebraic curve that is asymptotically stable in the sense of geometric invariant theory. This is equivalent to the condition that it is a complete connected curve whose only singularities are ordinary double points and whose automorphism group is finite. The condition that the automorphism group is finite can be replaced by the condition that it is not of arithmetic genus one and every non-singular rational component meets the other components in at least 3 points (Deligne & Mumford 1969).